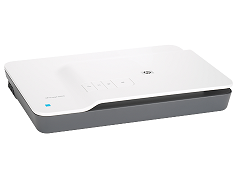 HP-FB-G3110-Scanner Easy-to-use, affordable flatbed scanner for great image quality scans using four one-touch buttons and a quick-and-easy, task-based interface. Versatile scanning features and simple document archiving options. Easy scanning—Four one-touch buttons and scan shortcuts for completing common tasks. Versatile scanning options—Scan up to A4-sized documents. Use the built-in transparent media adapter for slides and negatives, and flatbed for thick materials and 3D objects.